In 1953, Rex Thomas, an engineer for what was then Graco Metal Products, needed to design new products for the company. He turned to his own experience as a father, asking how he could make parenting easier with safe, reliable baby equipment. The Swyngomatic, the very first automatic baby swing, was born. They didn’t anticipate such a huge demand for them and sold millions over the next few years. By 1987, when Nate Saint developed the first Pack N’ Play portable playpens, Graco had become a household name. Graco and their 1500+ employees around the world stand by their promise of making life easier with quality products that generations have trusted for their children. They are one of the major players in the car seat market, which is why we’re taking a look at the popular Graco Milestone All-in-One to see if it lives up to the hype. Why should you consider this convertible seat? Like most convertible seats, the Graco Milestone starts out as a rear-facing infant seat, then converts into a forward-facing seat and then into a booster seat when your child is big enough. They have pillow inserts to ensure a proper fit for small infants, which can be removed when they no longer need them. In booster mode, the back cannot be removed, however, unlike some convertible seats. Note: When looking for a convertible seat, keep in mind that some experts believe starting with an infant seat is the safest option for very young babies. What features set the Graco Milestone apart? Like all Graco products, the Milestone was designed with safety and comfort in mind. Its convertible features and easy latch system are designed for the busy family who doesn’t have the time or money to shop for a new seat for every stage of their child’s life. What are the child size ranges for the Graco Milestone All-in-1 Convertible car seat? 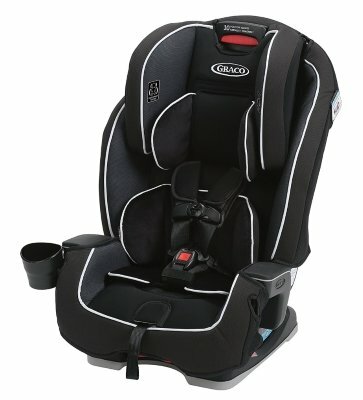 Note that the comparable Graco 4Ever 4-in-1 Convertible seat has a 4 lbs. minimum weight in rear-facing as opposed to 5 lbs. for the Milestone. The Graco 4Ever also has a maximum weight range of 120 lbs as opposed to 100 lbs. for the Milestone. However, the seat itself is 3 lbs heavier and a few inches bigger overall. It’s also double the price of the Milestone. How big is the Graco Milestone, and will it work in your vehicle? Like most convertible seats, the Milestone does not come with a base, nor does it act as a portable infant carrier. It’s not compatible with strollers, either. This is a seat meant to stay in a vehicle at all times. The rear-facing mode in a compact car could be a tight fit, leaving less legroom for front seat passengers. Though on the heavy side, it’s not so heavy as to prevent transferring between vehicles if needed. Air travel tips: The Graco Milestone is FAA approved only with the 5-point harness and not in booster mode since airplanes have no shoulder straps. Though it should have FAA certification info in the manual and a sticker on the seat, some parents found no sticker on their seats. This could be a problem for flying, particularly international flights. Check for the FAA sticker on your seat and call Graco and your airline if it’s missing. 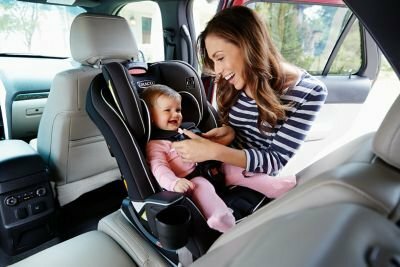 How safe is the Graco Milestone All-in-1 Convertible car seat? Child safety experts recommend keeping your child in a rear-facing position for as long as possible. The Milestone works as a rear-facing seat up to 40 pounds, the size of most 4-5 year old children, which is a longer range than many car seats offer. The Milestone is part of a car seat test program through Consumer Reports. They rated the Milestone excellent for booster fit and very good for ease of use, rear LATCH and belt, and forward LATCH and good for forward belt use. Possible flaws: Some caregivers couldn’t get tighten the latch and seat belt enough after installing. If you feel like your car seat is too loose, confer with a car seat technician or call Graco customer service. Other parents found that if food crumbs get into the harness tension latch, the shoulder straps may loosen during use. Thoroughly clean out any debris from snacks often. Using a good vacuum with strong suction might work best to remove loose crumbs. Real life experience: One mother said the Milestone saved her 1-year-old son’s life during a crash in which her vehicle rolled 5 times. He didn’t even have a scratch. How hard is the Graco Milestone All-in-1 to install? When positioned correctly, most parents had no problems with installation. The level bubble on the side of the seat helps you find the proper angle for installation. Like most seats, you should install the Milestone with either the LATCH system or the seat belt, but not both. Graco’s InRight LATCH system is designed to make installation quick and easy, even one-handed. There’s an audio click cue to let you know it’s buckled in right so you aren’t left wondering if the seat is secure. Four recline positions are available to give your child the most comfortable ride. Positions 1 (most reclined) and 2 are for rear-facing while 3 and 4 are only for forward-facing. Possible flaws: For vehicles with a third row seat, installation in forward-facing mode could be problematic due to different seat belt positions. The seat belt path in booster mode may be a little narrow for some car seat belts, which could pose a challenge if you’d rather your child buckle him or herself in. You don’t need much in terms of add-ons with this seat, but there are always a few extras that can simplify everyday life. Munchkin Auto Seat Protector – As you might expect, it keeps your seat clean, which could help with the crumb accumulation issue. It also has a non-skid surface to prevent the seat from sliding around on slick vinyl or leather seats. The front pocket stores crayons, small books, tissues, and snacks for your toddlers. Munchkin Miracle 360 Sippy Cup – If you’re tired of spills, get these BPA-free sippy cups with a spoutless design, which dentists recommend. It seals automatically when your child isn’t drinking. So if you hear an “oops”, you can be relatively certain that apple juice isn’t spilling all over your floorboard. Skip Hop Baby Zoo Snack Cup – Like the sippies above, this snack cup has a no-spill flexible opening to keep those Cheerios in check. The clear body lets you see when a refill is needed, and it’s sturdy enough to hold up to toddler wear and tear. Here’s a rundown of our findings about the Graco Milestone All-in-One. All in all, we highly recommend this seat. Many seats have recalls frequently, but the most recent recall (2016) of the Milestone involved a non-life threatening misprint on the side stickers. Real-life crash testimonials reinforce how safe this seat is, plus there are very few complaints of dangerous flaws, and many of those could be easily remedied. Moms will appreciate the movable cup holder. Some integrated cup holders can get in the way of installation or take up too much room when you already have a crowded back seat. At least you can move this one around or just remove it altogether if needed. If you want a portable infant carrier or frequently need to switch car seats between vehicles, this is probably not the seat for you. However, if you’ve been eyeing the Graco 4Ever seat, this one will save you money while offering a comparable ride for your baby. For your growing family, we recommend giving this seat a try. You won’t have to spend money switching from seat to seat as your children grow.